Just as you are at a loss for what to do next, your eyes notice a large sign in your yard saying “You’ve Been Flocked!” The cars on your street are slowing down to look at your new yard décor, and you notice your neighbors are laughing. Still in a state of confusion, you notice a lone pink flamingo with a note from a neighborhood school tied around its neck, staring at you from the edge of your porch. The note demands a ransom be paid in order to get rid of the embarrassing birds in a timely manner. Do you follow the instructions and pay up so the birds will migrate to your laughing neighbor’s house? Of course!! Step 1: Get a whole bunch of flamingos. Step 2: Let everyone in your organization know about your Flamingo Flocking Fundraiser so they will know to participate (or protect themselves from Flamingo Flockings by purchasing "insurance"). Step 3: Take orders from people who would like to have a friend or family member’s front yard flocked. Charge a fee or ask for donations. Step 4: Sometime during the night, sneak into your unsuspecting victim's front yard and deposit a whole flock of pink plastic flamingos. Make sure they are grouped and looking their finest. Step 5: Write a note that explains to the victim how they can have the flock removed from their yard if they pay a fee (or donation). Step 6: Make a large yard sign that says “You’ve Been Flocked by XYZ Organization” so your fundraiser draws attention. Step 7: When the victim calls, collect the ransom and make arrangements to move the flock to the next location. 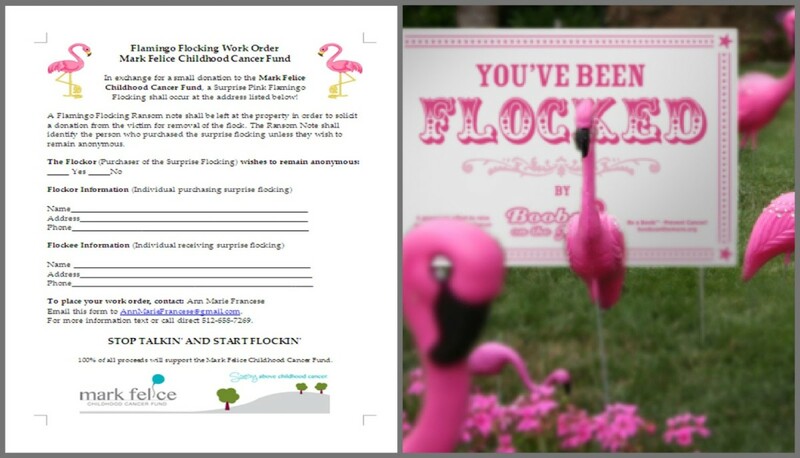 Step 8: To keep up the excitement, be sure to publicize flamingo flock sightings by posting pictures on your organization’s website or Facebook page, in the main lobby of your building, or in a newsletter. Step 9: Make sure you announce a specific beginning and ending date so everyone will know how long they have to participate. Don’t do it for too long or it will no longer be a novelty. A couple of weeks are usually sufficient. Step 10: Make a special announcement of how much money was raised for your organization. Be sure to make a big deal out of the success of your event so everyone will participate next year. Step 11: Carefully package up your flamingos and store them in a safe place so you don’t have to buy as many for next year’s annual Flamingo Flocking Fundraiser! The Perfect Fundraiser for a Nonprofit Organization! How many flamingos do I need? That depends on how many people will work each night AND how many lawns you plan to do at the same time. In order to be effective, you will need one whole "flock" of flamingos per lawn flocked. You should plan for 10 to 20 flamingos PER FLOCK (depending on the size of the yard). If you have several teams of people flocking at the same time, you will need at least one flock for each team. For example, I had five teams and gave each team TWO flocks of 12 birds each (24 flamingos each team x 5 teams = 120 flamingos). NOTE: If you are buying in bulk, you will most likely be purchasing your flamingos by the dozen. Therefore, you will need to work in multiples of twelve. Once you have determined how many flamingos will be in each "flock", use this formula to determine how many total flamingos you need. Can I rent flamingos? Yes, there are several online stores that rent flamingos. However, if you rent your flamingos, you will be responsible for their safe return. From my experience, you WILL lose a flamingo or two (or three) so it may be cheaper to purchase your own. Plus, if you plan to do this annually, you will make more money over time by purchasing your flamingos. How much do flamingos cost? If you buy the flamingos in pairs (rather than in bulk) they are too expensive to make a good profit during your first Flamingo Flocking Fundraiser. 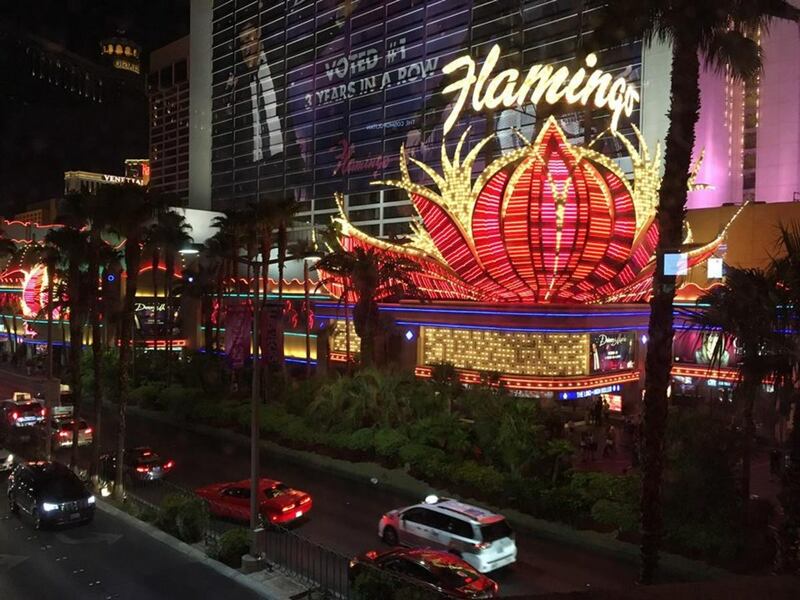 However, if you look for bulk pricing and buy as many as you are financially able at one time, you should be able to pay under $6 per flamingo. Where do I buy pink flamingos? Believe it or not, there are many vendors who sell pink plastic lawn flamingos. In order to find the cheapest price, start with your local Walmart, Target, Home Depot, craft store, or any store that has a lawn and garden department. Tell the manager of the store how many you need and ask if they will order them for you at a discount. Better yet, ask if they will donate some or all of them in exchange for sponsorship advertising on all of your signs and forms. If that doesn't work and the flamingos are still too costly, you should look at purchasing them online for bulk or wholesale pricing. You can find lots of bulk flamingos on eBay or you can do a Google search for "Flamingo Flocking". A few of the online stores not only provide flamingos, but they also have fundraising kits with printed signs, carrying cases, and fundraising instructions. If you are nonprofit, don't forget to use your tax exempt status. 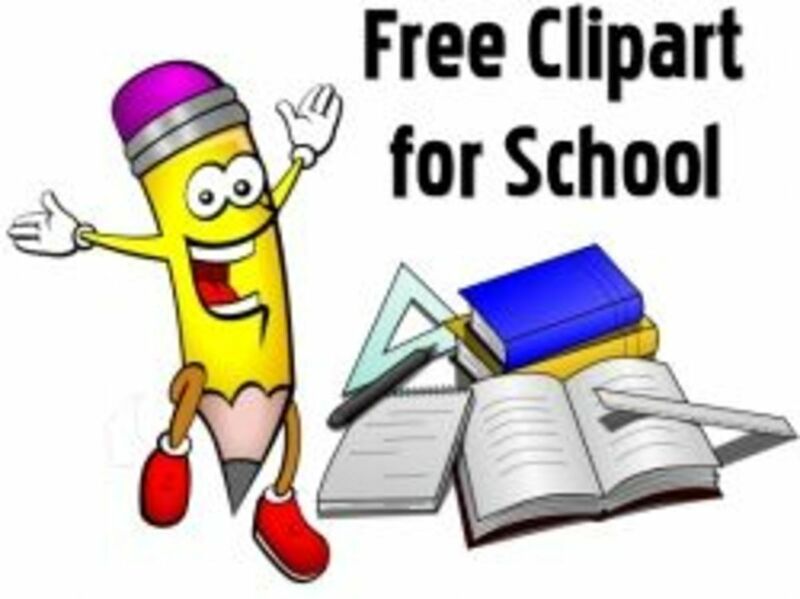 If you are a school but not tax exempt, ask if they give school discounts (most vendors do). What if we don't have money to purchase the flamingos? Find a sponsor who will either pay for the flamingos as a donation or will let you borrow the money and be repaid at the end of the fundraiser. 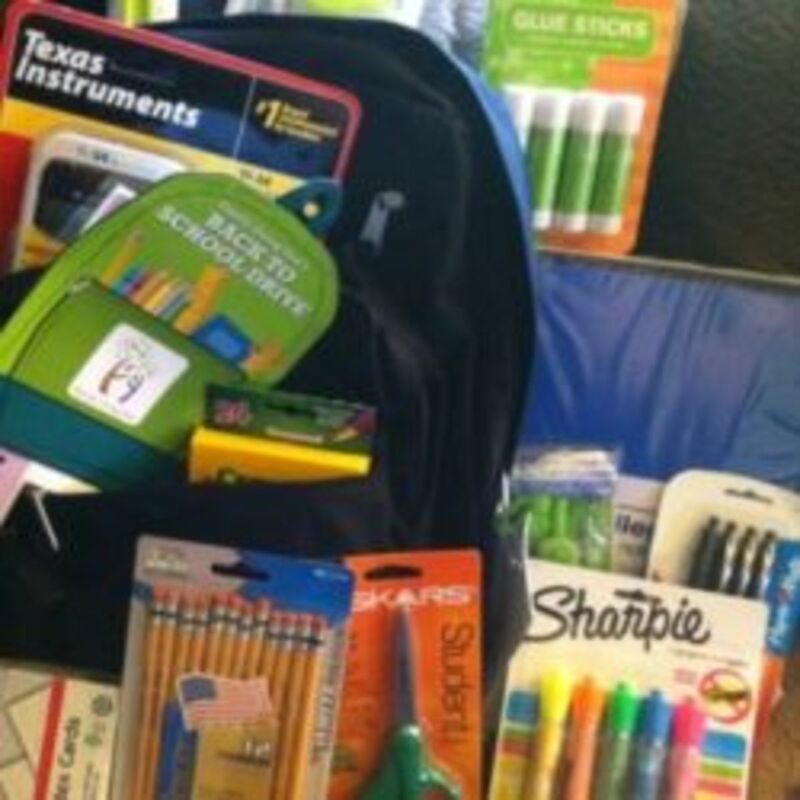 If the fundraiser is for a group of individuals who will personally benefit (i.e., a dance team going to competition, cheerleaders who will purchase uniforms, youth group members going to camp, etc), have each member contribute an equal amount that will be reimbursed if the full amount of the fundraiser is achieved. The individuals would have paid this money toward their event anyway. Take flocking pre-orders and offer a discount if paid several weeks in advance. Make your own flamingos with cardboard and wire. Be creative! You don’t have to use pink flamingos. You could use any ugly, strange, or highly noticeable objects to decorate someone's front yard. Remember, the uglier or stranger the better. Think garden gnomes, stuffed bunnies, plastic dinosaurs, or toilets. Not a member of Hubpages yet? You can signup here! There is no right or wrong way to do a Flamingo Flocking Fundraiser. In fact, the more creative you are, the more successful your event will be. However, it is important for your organization to determine what is going to work best for the type of people you will be flocking. Here are some examples of how you can change things up a bit. Some people offer "insurance" so that people who don't want to be flocked can just pay a donation in advance. Some organizations start their event by only flocking yards that have been prepaid. However, to launch our fundraiser, each family (or team) picked one or two of their personal friends/family and flocked their homes first. These team members did not need to pay because they were doing the volunteer work. Once the flocking started, it snowballed. Using a large sign that tells the homeowner they have been flocked and instructs them to call a certain number is a necessity. However, we had even greater success by attaching a clear 8 ½ x 11 sheet protector to a single flamingo that was propped near the front door. One side of the sheet protector held a form with instructions for paying to have the flamingos removed. The other side was a picture of the group who would benefit from the fundraiser and information regarding where the money was going. Another idea is to only flock the inside of a business office. This requires fewer flamingos but would be limited to the amount of employees available for flocking. You could only offer your flamingos for birthdays, anniversaries, and other special occasions. If you are going to do this, have signs already made (or require the person ordering the service to provide their own special occasion signs). With this idea you can charge more and leave the Flamingos in the yard longer. Remember, you won’t be asking the recipient to pay to have them removed since this is a “gift” for them. This brings me to the next variation. 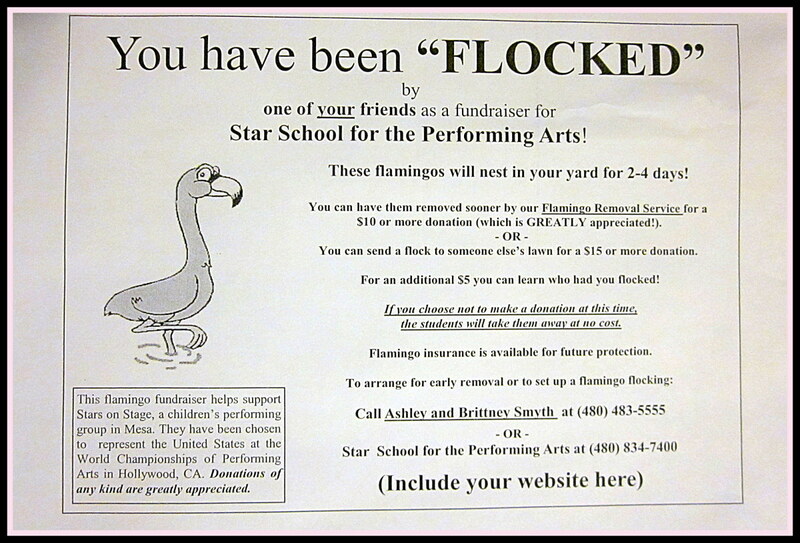 Most fundraisers only charge to either have the yard flocked OR the the flock to be removed...we charged for BOTH. This means someone paid to have their friend's yard flocked, then the friend paid to have their friend flocked and so forth. No one ever paid to simply have the flamingos removed. This kept the chain going. There are many variations on the theme and storytelling of the actual flocking. 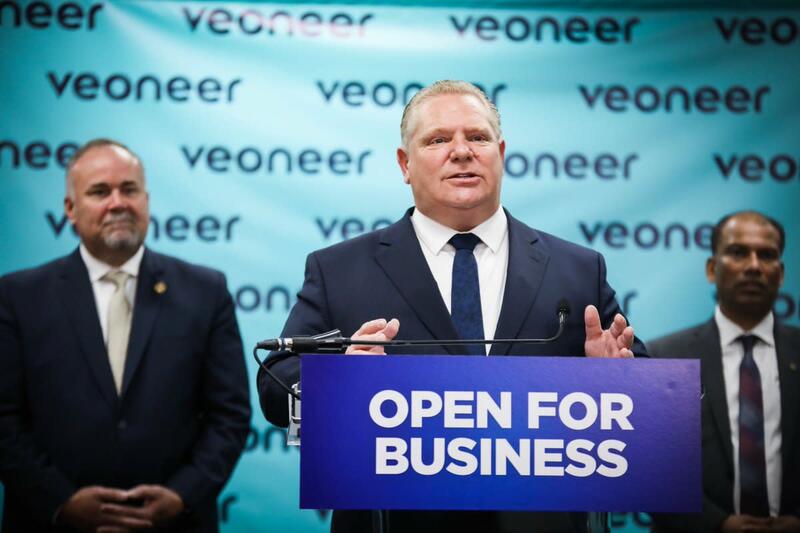 For example, one organization might write a ransom note in a mysterious font, another might be more business-like and use a traditional form, while another might be more dramatic and "demand" payment or suffer the consequences. Personalize the flamingos to reflect your organization with costumes, school or club colors, doll clothes, etc. The more ridiculous the flamingos look, the more attention they draw. The more attention your Flamingos draw, the faster people want them removed. For example, we dressed our flamingos up in wacky costumes with feather boas and beads to represent a singing and dancing group. A baseball team could dress their flamingos up with baseball caps in team colors, a high school could do everything in their school colors, and a church group might choose to put their flamingos in miniature choir robes. This is a great way to get the kids involved. Who doesn’t just love dressing up pink flamingos!? Not into dressing up flamingos? You can just keep it simple or...you can be just a LITTLE dramatic by gluing rhinestones to your flamingos. The rhinestones will catch the light of the sun and draw even more attention to your flocking. Don’t take this fundraiser too seriously. The more fun people have, the more they will pay to keep the flamingos migrating from yard to yard. Take lots of photos! But…don’t use a flash at night…we got caught at one house because one of the kids used a flash to take pictures of the beautiful flocking they had just done! Fortunately, the home owner was so impressed with himself for catching the kids that he paid them double to take the flamingos immediately down the street to his parent’s front yard and offered a bonus if they did NOT get caught again. You will definitely lose some of your flock due to theft or breakage or just plain misplacing the darn birds. Make sure you start with enough flamingos to get you through your entire fundraiser because if you are buying in bulk, it will cost more per flamingo when you buy just a handful to replace your lost inventory. The one thing we lost the most were the flamingo legs. Many of the online sites sell just the metal posts. This would be a worthwhile investment. Bring a hammer. Sometimes the ground is too hard and you will need something to pound the flamingo legs into the ground. Sometimes the holes where you insert the wire legs into the plastic flamingo get too big from the constant setting up and taking down. This will cause the flamingos to fall over. To keep this from happening, we used a glue gun and glued the wire legs to the flamingos. This made them more difficult to transport but we did not lose as many legs or have as many damaged and fallen flamingos after we did this. Be sure to send out a press release! Have a definite ending date so people won’t put off making their donations. Of course, if you are keeping your flamingos, it doesn’t hurt to offer flocking for special occasions (and special pricing) throughout the year on a preordered basis. There will always be one or two spoilsports who will think people coming into their yard in the middle of the night is not very funny. When this happens just apologize, remove the flock immediately, and ask the sender to pick a new victim. Never argue with someone who is unhappy about a flocking. This will only aggravate them more. Make sure you have a ready supply of adults to drive your teams around at night. Supervision is crucial. 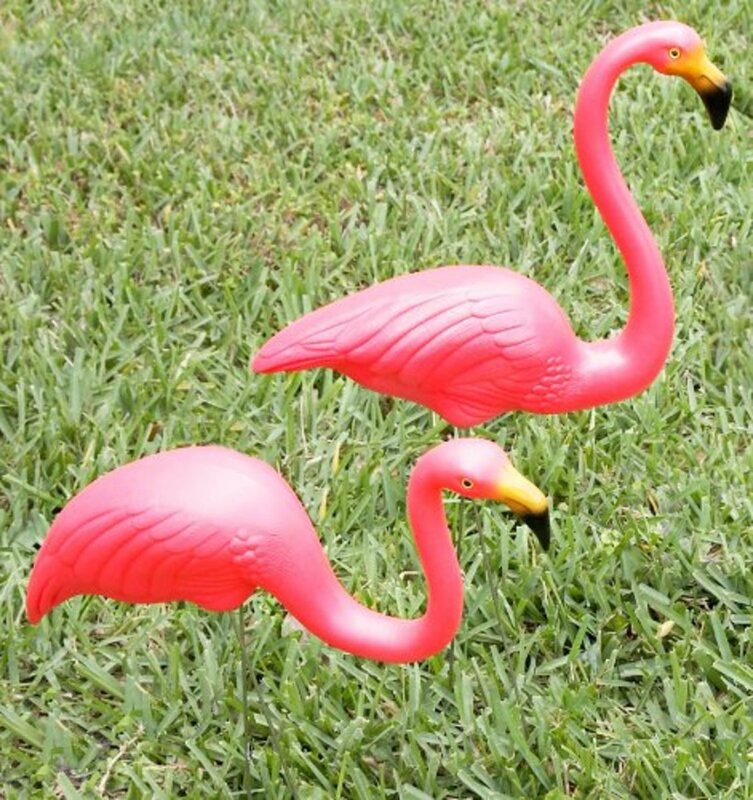 Would you pay to have a flock of flamingos removed from your yard and placed into an unsuspecting friend's lawn? Yes! It sounds like fun! No. I don't like people putting things in my yard. Maybe, depending upon which organization is doing the fundraiser. Welcome to the flocking neighborhood! Have a fabulously flocked day! What Do You Think of Doing a Flamingo Flocking Fundraiser? It sounds like a good idea depends on the organization. the dollar tree has the 9" flamingos on their website for a $1 each... 16 come in a box.. so you'd be paying $16 plus tax... instead of buying them as a pair. What a clever idea! I love this - flamingoes have a special, campy history in Austin, so it would go over well here. This is more earth-friendly than toilet-papering a house and less inconvenient than the fad of having people arrested.